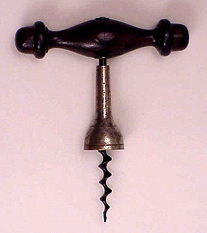 A Walker corkscrew with short barrel handle, wire cap lifter in handle and speed worm. 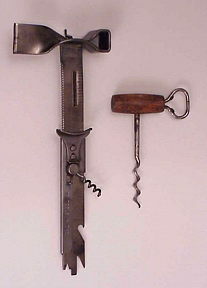 Charles Griswold's July 22, 1884 American patent. What do you think of this trade? Email your opinion to corkscrew@bullworks.net or leave your opinion in the guestbook. Refer to MACLEAN-BULL TRADE and indicate A, B or C.
Bull finally wins one! But Ron is happy too, cause he's a cool tool guy!